(00:00 Hello, this is Abigail Lambke with the audio production for “Arranging Delivery, Delivering Arrangement.” This is the section on conversation. (00:11) This webtext is at the intersection of four conversations: those on sonic rhetoric, podcasts, delivery, and arrangement. But in essence, it is a response to Collin Gifford Brooke’s (2009) Lingua Fracta, in which he reworks the rhetorical canons for new media. In this audio production, I’ll be explaining how I work with Brooke’s ideas, how I diverge from him, how I add elements related to sound to his concentration on primarily visual or coded interfaces. I’ll also be explaining those four conversations of sonic rhetoric, podcasts, delivery, and arrangement and how they come together for this webtext. (00:50) But before I begin, I want to reiterate the design of the webtext. I perform the argument sonically through these recorded pieces, providing the transcript with timestamps. The Conversation section includes two pieces, one framing the piece and including background on sonic rhetoric and podcasting, the other focusing on arrangement and delivery. Throughout, due to my ethics of recording, I’ll name and paraphrase sources orally and include the citations textually in the transcript. Extended textual quotes are interspersed throughout the webtext, signaled by enclosure in dark blue boxes. You’ll hear me referencing them sometimes, but again, either listening or reading will convey my argument; doing both at the same time adds another layer on top of that. (01:40) With that behind us, let's begin with Brooke. His 2009 Lingua Fracta is an attempt to rework the classical canons of invention, arrangement, style, memory, and delivery for new media. Brooke focuses throughout on interfaces, emphasizing that a disciplinary focus on objects is limiting (p. 27). By focusing on interfaces, Brooke accounted for a more flexible conception of rhetorical canons for the digital age (p. xvii). In doing so, Brooke resisted rhetoric’s disciplinary focus on close reading, arguing that this practice fails to accommodate the practices of new media that do not always result in static products but in ongoing interfaces (p. 14). I’ve included choice quotes from Brooke in the webtext blue boxes. In Lingua Fracta: Towards a Rhetoric of New Media, Collin Gifford Brooke (2009) turned to classical rhetoric in order to discuss new media interfaces, writing, “a rhetoric of new media requires us to rethink our disciplinary habit of attending to textual objects; however, we do not need to invent this rhetoric wholesale” (p. 27). While rejecting separated rhetorical canons as a practice of explaining static texts, Brooke directed his attention to reworking them to fit the shifting nature of new media interfaces. He suggested that rhetoricians should “conceive of classical rhetoric less as a set of static absolutes and more as a collection of situated responses” (p. 43). Brooke situated these responses as an “ecology of practice” that can be used to “both interrogate and produce new media” (p. xvii). He turned to ecology because it has the “ability to focus our attention on a temporarily finite set of practices, ideas and interactions without fixing them in place or investing too much critical energy in their stability” (p. 42). By focusing on interactions, Brooke conceived of “canons as relations rather than categories” (p. 44). In one early example, Brooke explained this new form of relational canons through track-backs, writing “canons are not mutually exclusive categories, but complementary perspectives that allows us to focus on different dimensions of even a single practice” (p. 55). Brooke chose the concept of interface because the disciplinary focus on close reading of objects fails to accommodate many of the practices of new media (p. 14). “A turn toward the interface as our unit of analysis would be an acknowledgement that it is not necessary that these processes culminate in products (which can then be decoupled from the contexts of their production), but rather that what we think of as products (books, articles, essays) are but specialized, stabilized instances of an ongoing process conducted at the level of interface” (p. 25). (02:29) Through his idea, a podcast is really both an object and an interface. It is an object in that there is, indeed, a product, a stable audio file that is either streamed or downloaded. But while an individual file is static, the podcast itself is not. (02:47) In working with this project, I would listen to the same episode repeatedly, sometimes years apart. And those files were sometimes different in different delivery streams: the file on a website was different than the one on iTunes, or Downcast, the app I use to listen to podcasts. In one specific instance, the podcast changed the name. I had been working with Fugitive Waves from the Kitchen Sisters, and when I returned to work on the project, it was called The Kitchen Sisters Present, instead. There’s also the development of a podcast series over time, often early episodes are distinct from later episodes in style or sometimes even content. (03:26) So while each episode of a podcast is stable, the podcast, itself, as an interface is much more fluid. There's significant divergence, admittedly, here between myself and Brooke (2009) on the choice of artifact, but podcasts are still an interface. (03:40) In addition to interface, the other crucial term for Brooke (2009) is ecology. His argument throughout is that the rhetorical canons are better thought of as an ecology than as a process (p. 37). This means that choices in one canon can influence others as in a dynamic ecological model. Also, a specific canon might have several layers (p. 57). (04:02) Brooke (2009) thus expands the canons and shows the relationships between them. He emphasizes that this perspective should be both analytical and generative, preparing future rhetors to make their own choices regarding composition (p. 22). That argument is one reason I’ve included these audio renditions of each section in this project, as a generative proof of concept. The Outro also includes implications for students and podcasters as composition of podcasts continue. Brooke (2009) chose the concept of ecologies, emphasizing how an ecology might “appear stable from a long distance” but is actually “in constant flux” (p. 28). Thus, they “focus our attention on a temporarily finite set of practices, ideas, and interactions without fixing them in place or investing too much critical energy in their stability” (p. 42). For Brooke, this meant that an ecological model is ideal for analyzing an interface, “itself a momentarily situated encounter among users, machines, programmers, cultures, and institutions” (p. 42). Additionally, the canons are a “set of catagories” that “preserve the dynamic flexibility of an ecological model while providing us with some ability to distinguish one practice from another” (p. 42). This means that they might change across interfaces, but rhetoricians can still discuss elements of them: “the canons are mutable and dynamic ... they shift with changes in our discoursive technologies as those technologies constrain particular strategies and make others possible” (pp. 57–58). (04:32) Ecology is the main emphasis of this webtext, as my title indicates. In my argument, I focus mostly on arrangement and delivery, although the other canons of invention, style, and memory are certainly also ecologically present in podcasting. I work from Brooke’s (2009) concepts of arrangement as pattern (p. 97), and delivery as performance (p. 170), but I do so from the perspective of sound. (04:57) This concentration on sound is the final place where I expand on Brooke (2009), and in doing so, diverge from him. While Brooke concentrates on visual and coded interfaces—things like word clouds (p. 110), trackbacks (p. 55), gaming interfaces (p. 134)—my argument extends these into podcast, a medium dependent upon sound. This focus on sound is an addition to the growing discipline of sonic rhetoric, the conversation I’ll cover next. (05:27) Sonic rhetoric is a growing field, with scholars often concentrating on how sounded production and reception are uniquely rhetorical. For myself as a scholar this grows out of studying Walter J. Ong (1971) and secondary orality. Ong considered early iterations of secondary orality, like radio and television, as a revived emphasis on sound that grows out of literacy, and is distinct from primary orality, or the type of orality that existed previous to literacy. Secondary orality, in Ong’s conception, comes after the age of print and returns to an emphasis on sound, but does not return us to a time previous to writing. Instead, the age of secondary orality retains the psychodynamics of print including overt structure and linearity, but also incorporates sonic elements. That means that secondarily oral compositions, while sounded or voiced, are still dependent on features of literacy like scripting or mapping. Ong (1982) summarized secondary orality, as “essentially a more deliberate and self-conscious orality, based permanently on the use of writing and print” (p. 134). Ong (1977) emphasized that this does not “wipe out” older media forms: “A new medium of verbal communication not only does not wipe out the old, but actually reinforces the older medium or media. However, in doing so it transforms the old, so that the old is no longer what it used to be” (pp. 82–83). Ong referenced “talked books” (p. 83) as evidence, explaining that recording equipment enables a book to be “written” without text. “The new kind of book, once it is printed, may look like older books, may not have a recording or tape in a cover pocket, but it does not sound or work the same way” (p. 83). (05:58) Other terms could be certainly used to describe podcasts, rather than secondary orality, like Ulmer’s (2003) concept of electracy. But I prefer the term secondary orality because of its embedded emphasis on sound, something I find that is often lacking from rhetorical discussions of technology or new media. For example, Carolyn Handa’s (2014) The Multimediated Rhetoric of the Internet openly dismisses verbal elements of digital rhetoric. Thus, using a term that foregrounds orality is important for sonic rhetoric because it shows that significance of sound. (06:34) In some ways, sonic rhetoric is connected to primary orality, or even the chirographic age, because it connects rhetoric with its roots as an oral practice. The origin of rhetoric was one of a vocal performance with orators declaiming and speech as predominant. In the present, we only have records of those oral performance through literate practices, and it is impossible to recover the sound. In today’s age, however, we can freeze sound and permutate it, altering the practice of delivery, and through the ecological relations of the canons, other aspects as well, including arrangement. This situation has been complicated by new media studies, in which rhetoricians have become concerned with rhetoric across media, as well as sound. In the arena of sonic rhetoric, the push toward the study of sound was further spurred by Cynthia Selfe’s (2009) call in College Composition and Communication (CCC), in which she claimed sound was “undervalued as a rhetorical mode” and that in only focusing on text we harmed ourselves and our students (p. 617). (07:11) The ability to freeze, transmit, and replay sound opens the door to considering it in new ways. The blue boxes include further quotes from Ong about how rhetoric came to be focused on print instead of sound, and Cynthia Self’s (2009) call in CCC where she urges rhetoric and composition to consider sound an available means. That call has been answered through the ascendency of sonic rhetoric. (07:40) But in an echo of Ong (1977), I want to emphasize that the new medium does not replace old media or cause old media to disappear. Indeed, this webtext is a prime example of secondary orality. It has been designed to be listened to, but that design was planned through writing, scripting, and correspondence with the editors of Kairos. Furthermore, in attempting accessibility, even the sounded moments have been transcribed and presented. Finally, due to my recording philosophy alongside the desire not to bombard you with me reading quotes, exact words from sources as well as visuals and epigraphs have been included only textually. So, while I speak of sonic rhetoric or secondary orality, know that both of these elements are enabled by, supported through, and connected to media centered in other senses. (08:35) Other sonic rhetoricians take different tactics in presenting or performing their work. Another approach is to embed the sonic artifacts framed with textual analysis (Stone, 2015), or to narrate portions of a piece alongside visual and textual cues (Stedman, 2013). Still, another is to focus on the abstract elements of sound and voice, calling attention to the gaps in sonic rhetoric thus far entirely textually (Anderson, 2014). Or, you can record the entire piece (Bowie, 2012; Lambke, 2013). Sonic rhetoric is still emerging and there is no one right way to do it, but it demands a sensitivity to design, medium, and accessibility that print rhetorics have already standardized. (10:02) Studying musical elements, in these examples musical mixes and then choral practice, is important for sonic rhetoric. But the spoken voice is a distinct entity from the sung voice or the various elements in music. (10:20) Andrew Dubber (2013) claims in Radio in the Digital Age that mentally processing speech is a different experience than listening to music privately (p. 56), possibly because when we listen to speech we gather information. Also, Dubber argues that those who listen to podcasts are likely to create podcasts themselves (or for those of us who teach in composition and rhetoric, ask our students to do it) (p. 56). So, unlike the myriad of listeners to music who might not create and produce music, podcasters do. (11:39) Bowie’s argument encourages the use of podcasts in composition class to help students think about writing, a precept I certainly follow in my own pedagogical practice. Sound is becoming more of an available means for students, and teaching how to compose with sound asks them to reflect on those practices (Skipka, 2006; McKee, 2006). (11:58) This webtext includes some implications for the classroom, but its main focus in on professional podcasters. This is important because it interrogates a range of successful choices that have been made (or sometimes not made) in podcasting, and that’s research on rhetoric and production that can then be folded back into the classroom or our own productions. (12:18) So with that, let’s transition to talking about podcasting. (12:25) Podcasts are a growing medium. They were defined in 2004 (Berry, 2006) and added to iTunes in 2005 (Klowden, 2006). But, by 2014 the breakout-hit podcast Serial had over 40 million downloads (Roberts, 2014) and in the same year LibSyn reported that 2.6 billion podcasts were downloaded (Vogt, 2015). In 2015, Pew Research reported that a full third of Americans had listened to a podcast and one half were aware of them (Zickuhr, 2010). But, who exactly is doing the podcasting? And how might it be distinct from radio? (12:59) In a study of podcast motivations from 2011, Kris Markman explained that most podcasters are older educated men, with only 12% reporting as female (p. 553). In 2014, another study co-authored by Markman and Caroline Sawyer had similar findings: the mean age was 41 and 82% were male (p. 26). (13:21) The distinction between radio and podcasting is an important one. Podcasts are clearly a remediation (Bolter & Grusin, 2000) of radio. But, as Brooke (2009) criticizes, if we concentrate on remediation, it continually brings us back to old media and might lead to missteps in the practice of understanding new media (p. 19). So, while much of the content of radio and podcasts are the same—that is to say the objects produced are very similar—the interface of podcasting is distinct from the interface of radio. This is often a matter of choice—the choice of a listener to listen when and where they want to. 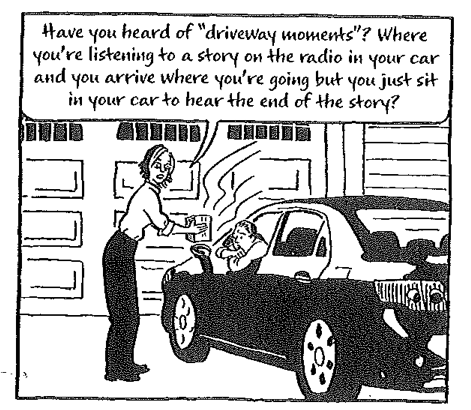 (13:58) In Out On the Wire, Jessica Abel’s (2015) graphic depiction on storytelling and radio, she explains driveway moments: when you are listening to a story while driving and when you get home you don’t want to turn it off, so you stay in your car and listen (p. 3). But with a podcast you're not stuck in a car, or by the radio. I do most of my podcast listening while walking the block or folding laundry. I pause when I want to; I restart it later. A 2010 study of podcast users’ motives from Steven McClung and Kristine Johnson reported that 68% of listeners use a portable media player to listen to podcasts, meaning they can move around and listen whenever they want (p. 89). Steven McClung and Kristine Johnson’s (2010) study of podcast users’ motives illustrated how seductive time- and place-shifting can be, reporting that 68% of users listen on a portable media player rather than being tied to a desktop or laptop computer (p. 89). Another motivation was time-shifting, explaining “users tune to podcasts because they can turn in at any time, and people also appreciate the ability to access only the podcasts they like” (p. 91). Furthermore, podcast listeners like the social aspect of podcasts, or talking to others about episodes or the act of listening (p. 91). Jessica Abel (2015), in the graphic text Out On the Wire, highlighted the concept of the “driveway moment” as evidence that radio can draw you into a story in a way that is “transcendent” (p. 3). Podcasting can create a similar feeling, but without the driveway. (14:37) And choice is a factor for the podcast creators, too. Many are not connected to traditional media corporations, or at least not broadcast on airwaves regulated by the FCC, so they can embrace topics that might not be suitable for a wide audience. Thus, podcast hosts can concentrate more on creating an intimate relationship with their listeners. Vincent Meserko (2014) claims this in an article on Paul Gilmartin’s Mental Illness Happy Hour, discussing how a podcast can bring the listener in with human personal details (p. 458). Vincent Meserko (2014) examined Paul Gilmartin’s Mental Illness Happy Hour: “Gilmartin’s podcast preserves many of the affordances of traditional broadcast media, such as its intimacy and its private consumption, while simultaneously rejecting its top-down distribution, its FCC regulations, and its sometimes-prohibitive financial barriers” (p. 458). Merserko linked podcasting to the intimacy of listening to radio, but explained that the podcasting format leads to a deeper intimacy, because “podcasts such as MIHH have made visible those parts of a performer’s identity that were not previously disclosed, and invite audiences to identify with those disruptions in selfhood that are fundamental to being human” (p. 468). While radio already has a high level of intimacy because it depends on delivery of voice, podcasting increases such intimacies because it does not have broadcast strictures on content or manner; thus, a podcaster can share those parts of him or herself that might be silenced in broadcast radio. (15:12) One example from Radiotopia would be Strangers (2014), in which the host Lea Thau discusses her own heartbreak and dating process in an episode about love. (15:43) Lea Tau brings us into her life, so far into her life that she adds a comment for her parents to not listen. Such personal details are a far cry from the vast majority of spoken radio, which is often more distanced and about subjects, not the speaker. (16:00) Another affordance of podcasts’ digital distribution is one of access for those who might have been excluded from or discriminated against in traditional broadcast media. Raechel Tiffe and Meoldy Hoffmann (2017) suggest that podcasting is more accessible for women and minorities (p. 117), saying that you can reach an audience that wants to hear your actual voice, not a voice that has been performed to be acceptable for a wide audience (p. 118). Still, most successful podcasters are men, and more men attempt the role of podcaster. And perhaps that is an issue of delivery—women are often told their voices are deficient—too high, too low, too much vocal fry—or what have you (Anderson, Klofstand, Mayew, Venkatachalam, 2014). It takes a certain amount of courage or resilience or vulnerability to use a medium that focuses so much on the voice. Raechel Tiffe and Melody Hoffmann (2017) suggested “Podcasting allows women and other minorities access to broadcast media but with far fewer restrictions” (p. 117). They concentrated on how women’s voices are often considered “deviant” and how this issue has impacted journalism on TV and radio (pp. 116–117). However, in podcasting, “In general, the most you sound like yourself the better. Even those who receive criticism—disproportionately women of color—are still incredibly successful” (p. 118). Those with marginalized voices can thus find success in podcasts whereas they might be silenced in traditional broadcasting, yet the gap between male and female podcasters remains. This might be an issue of delivery. Why would a woman choose sonic delivery when for much of her life she has been told her voice is deficient? Tiffe and Hoffmann acknowledged that “podcast world is not a utopia, and that as long as there is an internet, so too will there be trolls disparaging the sound of feminine/feminist voices” (p. 118). (16:53) So far, many conversations about podcasting include the disclaimer that it is a new and growing medium, one that hasn’t much scholarship about it yet. I would agree with those disclaimers and add it on to my project, which I envision as a starting point for really discussing what a rhetoric of podcasting might sound like. (17:16) I’ll do that by putting these conversations of sonic rhetoric and podcasting alongside the longstanding conversations about rhetorical canons in my next section on delivery and arrangement. Thank you for listening. Goodbye. (00:07) ...this one focused on delivery and arrangement, particularly how they have been updated through Collin Gifford Brooke’s (2009) Lingua Fracta. (00:15) Both canons have been somewhat undervalued in the last century. For so long, conversations about rhetoric have been steeped in invention and style (Brooke, 2009; Porter, 2009). Before the age of new media, it was easy to dismiss delivery, although certainly not all rhetoricians did. And discussion of arrangement all too often turns into prescriptive advice, devolving into the five-paragraph essay structure. (00:40) But delivery has had resurgence especially in the past 15 years or so. Scholars have applied precepts of delivery to visual rhetorics and textual rhetorics (Ridolfo, 2012; Yancy, 2006). Others have analyzed digital delivery, like James Porter (2009), who calls for recovering the canon. Still, concepts of delivery can be shortsighted. Carolyn Handa’s (2014) analysis of digital delivery concentrated on the visual and non-verbal aspects of delivery in websites, dismissing sonic or verbal elements entirely (p. 111). (01:10) One ambitious monograph is Lindal Buchanan’s 2005 Regendering Delivery, which argues for a situational concept of delivery that includes the voice but extends from it, also incorporating social and ideological factors like access and genre (p. 3). Buchanan also focuses on collaboration, pointing out the fallacy of the solitary rhetor, instead examining the people who make delivery possible (p. 133). Buchanan's (2005) argument for situational delivery extended it from the classical conception: “Change the speaker, change the space, change the time period, and the surrounding constraints, strategies, and expectations change, too. Delivery involves far more than a speaker’s use of voice, gesture, and expression on a public platform; it involves complex interplay among a speaker, an audience, and plethora of social and ideological factors” (p. 3). Buchanan’s expansion here is applicable to podcasting, despite the gap in years and medium. There is a complex interplay between a podcast-rhetor and his or her audience, situated in their own social and ideological factors. Another significant element of Buchanan’s (2005) treatment of delivery was her concentration on the role of collaboration as part of delivery. She argued that delivery must be extended “from the speaker onstage to the web of backstage relationships that made her rhetorical delivery possible in the first place” (p. 133). For Buchanan, this was especially important for marginalized groups, who seek to participate vocally in the public forum. Buchanan defined collaboration broadly as a “cooperative endeavor involving two or more people that results in a rhetorical product, performance, or event” explaining that “while credit for the end result may go either to an individual or a collective, the product itself is constructed and completed through the direct and/or indirect contributions of others” (p. 134). Buchanan’s definition of collaboration is illuminative in relation to podcasting, which is often a joint endeavor of hosts, producers, guests, and others. Abel (2005) emphasized this as well in her graphic depiction of a radio show's writer’s room (p. 172). (02:47) Phoebe Judge lists people who produce, do sound, do artwork, as well as an upcoming live show and being a member of Radiotopia. In this way, delivery is not just the host and the guest speaking throughout the episode, but also all the other people, spaces, times, constraints, and aspects of Criminal, including their identity as part of Radiotopia. I’ll be talking much more about that in the next section. (03:16) The point I’m trying to make is that delivery is always a multifaceted endeavor, not just in new media and not just in sound. There are a multitude of aspects I could concentrate on when I talk about delivery in podcasting. But, what you are going hear mostly in this piece is a concentration on vocal delivery. That builds from Erin Anderson’s (2014) concept of vocality, and understands delivery as performance that goes beyond the words or the speech, but the construction of a number of social and bodily cues that listeners receive, or construct, or imagine as they hear speech. (03:57) In Lingua Fracta, Brooke (2009) concentrates on delivery as performance, stressing that delivery is not just the transitive movement of an object from one place to another (p. 170). Delivery, for Brooke, is also connected to identity and language, to how something might be created (p. 176). He works from Richard Lanham, who emphasizes that it matters how something is said, not just what is said. We all know this, although we might call it ethos, or credibility (Brooke, 2009, p. 182). Brooke (2009) privileged visual and graphic delivery, yet his perspective added nuance to the canon by concentrating on delivery as performance as opposed to delivery as transmission. He explained that we often conceptualize delivery as a “transitive process; it is rare to speak of delivering without an object that is delivered” (p. 170). Brooke built from Richard Lanham, critiquing delivery as a transitive process, instead advocating for delivery that “sees both circulation and medium gathered under the idea of performance” (p. 176). Performance, for Brooke, is linked to the idea of credibility, of performing rhetoric so that it will be understood and accepted (p. 182). In Lingua Fracta, Brooke shaped this into a discussion of blogging and Wikipedia, but delivery as performance is crucial to podcasting, too, as it privileges the primacy of voice. (04:27) For podcasts, much of ethos is centered in the vocal performance of the host’s voice, in the relationship he or she crafts with the voice, with the continuity of the voice across an episode or across a series. This vocal performance is a little bit of a slippery concept and an issue I address in the Procedures section, but it is a concept that should be interrogated, if only to expose the hangups we might have about certain voices. (04:56) Circling back to gender, could the issue of voice and delivery also be why so many podcasters are older men? So many women are told their voices are deficient—too high, too creaky, not credible—that they might resist a medium so focused on something society tells them they can’t do. The podcast 99% Invisible has an automatic filter for emails about women’s voices. The filter flags those complaints about women’s voices and sends back an automatic email telling the sender than the email will not be read (Morgan, 2015). It emphasizes that there is not such a filter for complaints about male voices. They don’t get them. This anecdote shows how vocal delivery can be important for podcasting, sometimes in troubling ways. (05:47) Jessica Abel (2015) highlighted the performative act of radio or podcast delivery by using Ira Glass in This American Life (pp. 101–102). I’ve included images of this section in the webtext blue box. (05:58) Glass tells us to sound like actual people, not to sound as if we are reading (Able, 2015, p. 101), even though elsewhere in the book they talk about scripting and many moments of podcasts are scripted before they are read. Glass also provides some tips for when you are struggling to sound like yourself. He says to to pitch the voice lower, to breathe, and lower the volume (Abel, 2015, p. 102). (06:24) Those tricks are connected to performing the voice, and the relationship between voice and delivery. They have to do with transmitting the voice as a transitive process, but also with credibility—we hear deep voices in this culture as more credible (Karpf, 2006). Breathing in and out relaxes us so that we sound more credible. This is all about performing the voice so it will be listened to and accepted. (06:54) One important note about Radiotopia is that as a collective they have have been intentional in including a range of voices, working towards gender parity in their hosts (Radiotopia 2014b). I've explained more in the blue boxes. In conceiving Radiotopia, creator Roman Mars paid particular attention to gender disparity, setting a stretch goal on Kickstarter, that, if funded, they would invite three women-hosted shows into the collective, thus addressing “the need for better gender parity both on the broadcast airwaves and in the more tech-y world of podcasting” (Radiotopia, 2014b). This might have been a stretch goal, not an original one, but still it acknowledges that the delivery of women’s voices is not always valued by an audience, and, once the goal was met, Radiotopia added needed diversity. As research into podcasting indicates (Markman, 2011; Markman & Jenkins, 2014) independent podcasting is dominated by white men, primarily those over 30. (07:11) A podcast is thus connected through the intimate identity of the voice to delivery, but this voice is also arranged, interspersed with other voices, with music, with sounds, and at least in the examples from Radiotopia, these voices tell a story. (07:25) Arrangement, unlike delivery, has not seen a resurgence in the past few decades. In fact, as Brooke (2009) relates, scholars of hypertext attempted to discredit it altogether, arguing that online the user gets to choose the arrangement, not just the rhetor (p. 89). But Brooke argues back, seeing arrangement as pattern (p. 92). He focuses on databases (p. 101) and tagclouds (p. 110) to show how patterns are a form of arrangement rhetorically effective in new media, even when working with a non-linear interface. (08:51) Ong’s (1975a) point about evanescence connects to primary orality and the practice of hearing sound. But even when sound is frozen, as in an audio file or production software, you have to manage the evanescence of sound. You can’t put too many sounds atop one another. (09:08) [Synchronous] You can’t put too many sound atop one another. You can’t put too many sound atop one another. You can’t put too many sound atop one another. Oh no, that's going to drive me crazy. (09:12) At its heart, then, this is an argument for linearity in sound—if we jumble the sounds in words, or words in a podcast, it becomes nonsense. But, the listener still has choices. They can listen to podcast episodes in any order they want to, or skip ahead or back 30 seconds here and there. But in the end, arrangement is a spatial canon and the space of sound is in time. (09:40) There are still patterns in podcasting, though, as my analysis of Radiotopia supports. And even more, the arrangement practices, the patterns of podcasts take place in a visual display in a sound editing program. (09:54) The play between visual arrangement and aural reception sidesteps those simplistic categorizations of sensorial media. I’ve been careful in this webtext not to claim that podcasts are an entirely sonic event. They might be primarily sonic for the listener, but the production of a podcast includes a number of moments that are tactile and visual. Clipping moments of audio and moving them, applying filters—all of this is not especially sonic, although it is constantly interspersed with listening to sections of sound. Thus, the podcast producer alternates between editing abstracted sound visually and listening to the results aurally. This all builds to a final rendering that leaves the audience with no visual cues to arrangement, only those aural ones in the recording. (10:42) The blue box shows Abel’s (2015) graphic representation of Radio Diaries as an example. 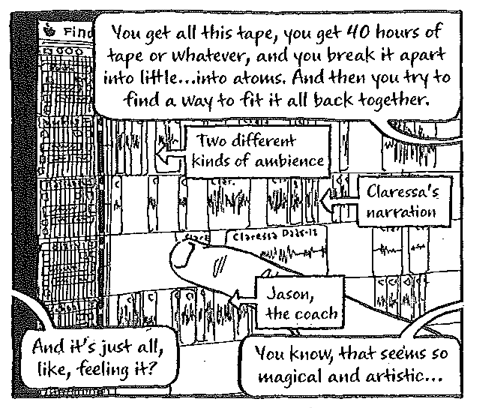 In this graphic display, you can see the pictures of sound as they have been abstracted in an audio editing program (p. 116) and then further abstracted in Abel's graphic representation. I’ve also included an image from this very audio piece you are listening to. One of the curious elements about abstracted is sound is that while it represents sound, it has little semantic meaning to someone unfamiliar with the files or the interface. Sound has been spatially represented, but to manipulate it fully, you still have to listen. Screenshot of audio editing program with file for part 2 of the conversations section. (11:23) Now, after the file has been rendered and most, if not all, of the visual cues have been removed, the aural cues of arrangement are still present in a podcast. (11:38) Aural cues could include the placement of non-vocal elements like music cues, sound effects, and background noise, as well as vocal ones of the host’s voice and interviewee’s voices. (11:46) In this study, I focus on the host’s voice as a vocal cue in arrangement. That overlaps with vocal performance in delivery in a way that furthers the ecological theory. In making these connections and showing the cues in the analysis, it is important to understand that I’m not working to be prescriptive. (12:06) One of the many complaints in the literature about arrangement as a canon is that it is too prescriptive (Stewart, 1987; Podis & Podis, 1990). It can be all too easy to show a successful arrangement system and then assume that is the only way. In this piece, I want to show several successful arrangement choices and how they connect with choices in delivery. But I am not saying those are the only ways. My argument, instead, is to show further evidence for a Brookensian ecology of canons, even with a linear chronos-centered artifact. (12:41) So, there it is, four conversations about sonic rhetoric, podcasts, arrangement, and delivery all through the lens of ecology and interface. I hope you’ve enjoyed this audio rendition of a literature review. Click onward for my Procedures section, where I’ll be much more explicit about how I treated my artifacts in this project in order to come to my argument and conclusion.